Looking for a Replant Option for your crop in Seward? Being independent, we have partnered with the best crop insurance company in Nebraska. This means we have the flexibility to truly find you the best possible product at the best price. insurance on most crops where offered. It applies to acres whether or not you meet the 20 acre/20 percent rule for replants covered by the federal crop insurance policy. Covers second crops if first crop was prevented plant and the acreage qualifies for double cropping. Your federal crop insurance policy may not cover all your replant expenses. 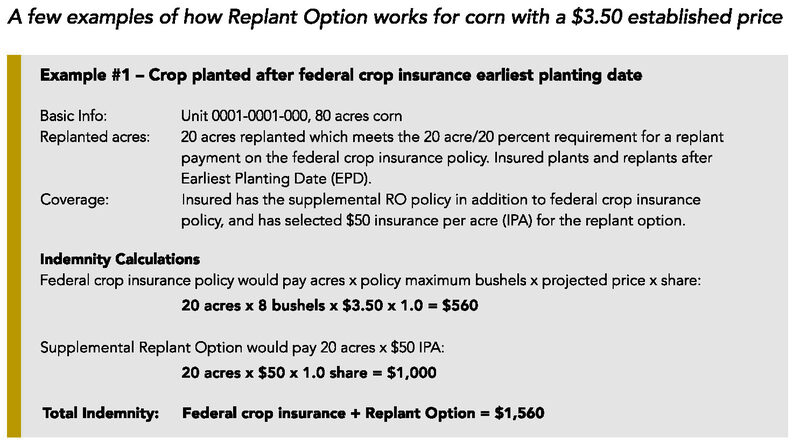 Replant Option policy pays based on the insurance per acre selected or, if selected on your application, by share.